Explore Columbus&apos; thriving craft beer scene with the story Crafting Columbus. Columbus&apos; craft beer scene keeps growing and changing, and that means you&apos;ll always find something new each time you visit. Greater Columbus breweries range from highly regarded production breweries to neighborhood nano breweries and everything in between. Columbus beer styles focus on using Ohio grain and an increasing amount of local hops. One fun way to explore the beer scene is through the Columbus Ale Trail! Pick up a Brew Book at any of the participating breweries, or an Experience Columbus Visitor Center, and use it to guide you through a great beer experience. Make a purchase at a listed brewery to get a stamp then earn free swag as you progress on the Ale Trail. Your first four stamps will earn an Ale Trail glass. 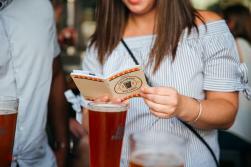 Visit 21 sites for a locally crafted Ale Trail key chain. For those that get stamped at all 41 locations, a Columbus Ale Trail pennant will be waiting at the end of your journey. Another way to enjoy the scene is by brewery hopping around the Brewer&apos;s Row corridor downtown. These ten breweries are all within about a mile of the Greater Columbus Convention Center. You can also hop on the free CBUS downtown circulator! Start at the north end at North High Brewing. North High Brewing (1) combines a sporty vibe, with lots of screens and decor made from reclaimed redwood bleachers from Ohio Stadium, with a huge variety of beers, including the Milk Stout, a favorite. One of Columbus&apos; newest breweries, BrewDog has three locations, one of which is on Brewer&apos;s Row. Check out BrewDog Short North (2) for some of the city&apos;s best craft beer. Featuring genre-busting beers with a focus on experimentation, the Humulus Numbus Super Pale Ale is a standard at Seventh Son Brewing (3), and the Scientist IPA is a constantly changing experimental IPA. With two great patios and a rotating cast of food trucks, this has become the nightlife hotspot. Hoof Hearted Brewpub and Kitchen (4) has a bright and swanky modern space and tasty food. Their Farmhouse IPA is a standout. Barley&apos;s Brewing Company (5), is one of the first breweries to open in Columbus, has hearty pub fare and specializes in Scottish Ales and the fun Firkin Fridays, where small batch beers are tapped. From one of the oldest, to one of the newest, Platform Beer Co. (6) offers a sprawling industrial-chic taproom serving a rotating selection of craft beer. Stop in to Gordon Biersch Brewery Restaurant (7) before a Columbus Clippers or Columbus Blue Jackets game and enjoy one of their fresh brewed lagers. Wolf&apos;s Ridge Brewing (8) pairs a culinary adventurous restaurant with a sunny tap room and delicious range of beers, including the Clear Sky cream ale and Dire Wolf, a Russian imperial stout. Elevator Brewery and Draught Haus (9), another long-time brewery, pairs a full restaurant menu with award winning beers like Mogabi, a hoppy wheat ale and Horny Goat, a strong stout. Elevator also has the Elevator Brewery Taproom (10) just a couple blocks away. What&apos;s better than brewery hopping? Getting some fun context from beer-loving guides, a designated driver and meeting the people who make some of Columbus&apos; best beers. 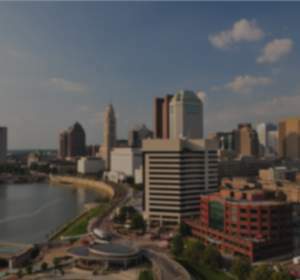 Columbus Brew Adventures offers tours in downtown Columbus, Grandview as well as tours of areas outside the city, and a beer and pizza combo tour. 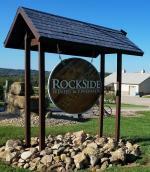 Do you need a break from the beer scene, or does part of your group want to split up? Check out Columbus&apos; wineries, such as Wyandotte Winery, just northeast of the city and Central Ohio&apos;s first and oldest winery! Wyandotte Winery produces a variety of fine handcrafted wines in a range of styles from dry to sweet and offers wine tastings, free winery tours and food truck Fridays. 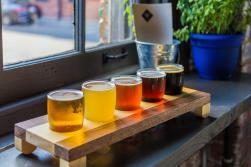 Enjoy Columbus&apos; brewery scene by hopping around the Brewer&apos;s Row corridor downtown. These ten breweries are all within about a mile of the Greater Columbus Convention Center. 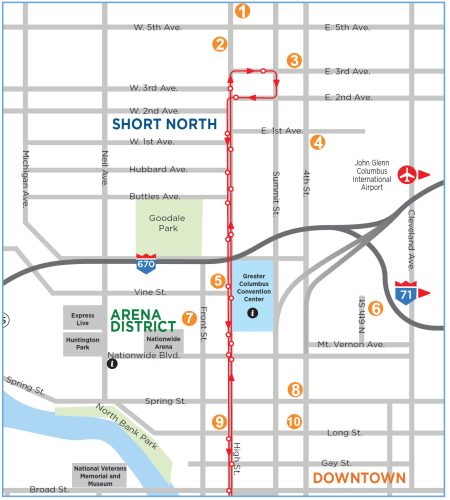 You can also hop on the free CBUS downtown circulator! For a deeper look into Columbus&apos; thriving craft beer scene check out this story: Crafting Columbus.